Enhance space, increase light, and create a welcoming space with our stunning aluminium bi-fold doors. Transform your home through increasing space, enhancing light and creating a welcoming space with stunning aluminium bi-fold doors in your Kent home. 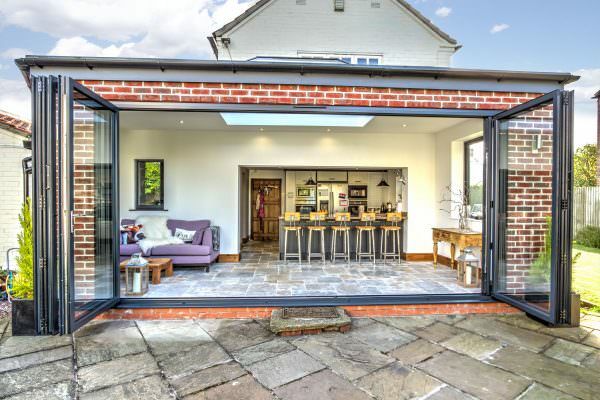 Bi-fold doors are becoming the latest trend for home improvements and can offer your home a wide range of benefits. Does your home struggle with spacing? By choosing to install aluminium bi-fold doors, you can increase the space inside your home effectively. Change the feel of your home by installing aluminium bi-folding doors to open up the space in your room. With the ability to fold back to just a few inches, allowing your space to provide a seamless entrance from outside. Help your room to feel more open, spacious and bright in your home in Kent, Maidstone or surrounding areas. Aluminium bi-fold doors give you more glass and less framing, allowing more natural light to seep in opening the views from outside. Our beautifully designed bi-fold doors are perfect for living rooms, bedrooms, kitchens and conservatories. Bi-fold doors provide your home with the wow factor. These doors offer a variety of colour options, including dual colours, we are sure we can find you a colour to suit your requirements. 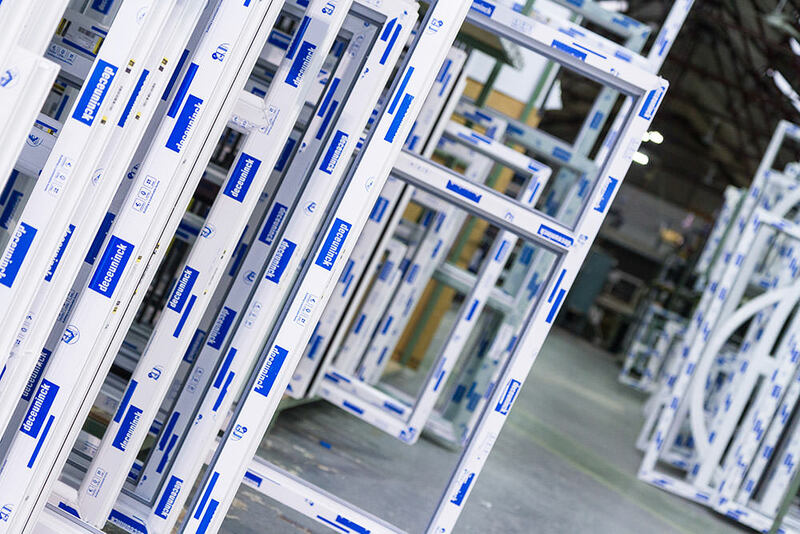 Frames fabricated using mitred corners for a more efficient structure. Whether you opt for a square or rounded edging, you’ll be impressed by the sleek and stylish profile design that the slim sightlines create. Fitted with a secure locking system and a domestic style ‘lift up’ handle for smooth access. Secure a market leading standard of both performance and quality, using the Visofold 1000 aluminium profile from Smart Architectural Aluminium. These bi-fold doors have many different features which provide excellent functionality combined with stunning aesthetics. All our doors come with the quality and assurance you would expect from a quality product. The strength, durability and security of these doors, ensure a low maintenance and reliable performance across a lifetime of use. Aluminium bi-fold doors can operate through opening in, out, stack to the left or the right, open in the centre, end or in between. Offering a solution for any style Kent home. They provide a robust stainless steel roller that glides smoothly, offering an effortless operation. Magnetic door clips are available to fully secure the open door sashes. Locking mechanisms are also available to offer maximum security to your home. Through the use of features such as hook bolt locks, one piece keeps, and shootbolts locking on floating mullions. When it comes to energy efficiency, our aluminium bi-fold doors significantly reduce heat loss and help to improve thermal performance to a high level. Double glazed with a standard 28mm offering fantastic performance, with the ability to enhance further by opting for 36mm triple glazed units. More complex design features include high quality EDPM rubber gaskets and weather brushes which allow improvements to be made to weather proofing. Other features include head vents for background ventilation, low thresholds for easy accessibility and integral blinds. With a range of different colour alternatives, our aluminium bi-fold doors can suit any home style. To suit the colour option and to complete your desired look, there are an array of fab and fix handle colour options. Handles are available in white, chrome or black, doors hinges are available in white or black. Choose between our natural frame colours or opt for a bolder, brighter colour to allow your bi-fold doors to stand out. All colours are available in the standard KL range or RAL colours through to the exclusive Sensation range of colours. The aluminium finish provides a guarantee for a maximum of 25 years against peeling, powdering, blistering, corrosion, fading and loss of sheen. All they require is a clean on occasion to keep them up to their optimum condition, by wiping them down. 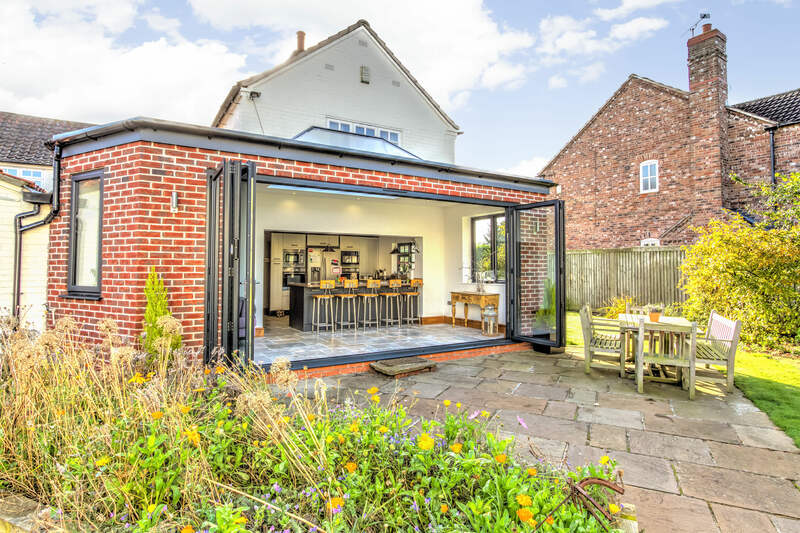 Aluminium bi-fold doors are thermally efficient, highly secure, offering a range of different configurable options and are environmentally friendly. Smart aluminium bi-folds can transform your property using their innovative folding functionality. 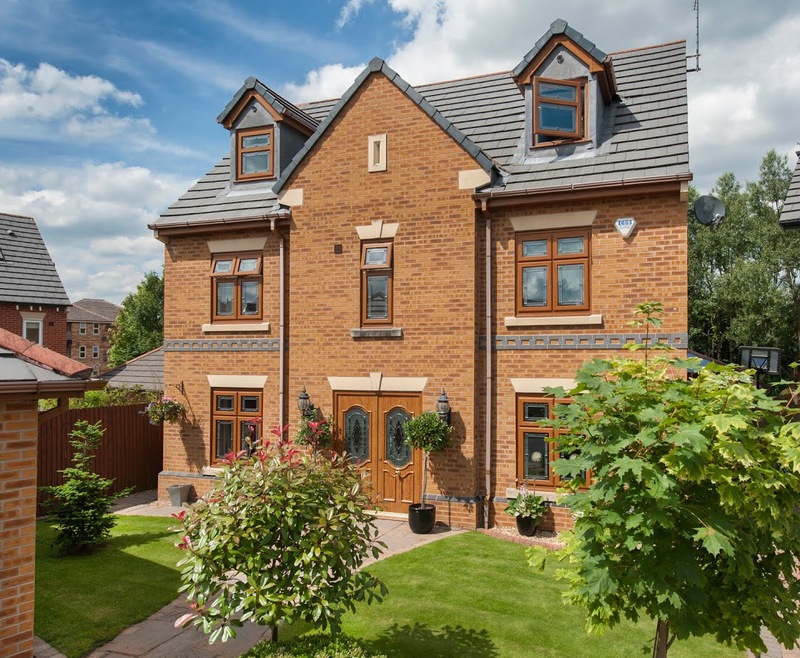 Enhance your home with a modern, intelligent and innovative design. Offering a range of different designs, our doors provide an influx of light throughout your home. The large, wide glazed windows offer a bright new addition to your room. Buy-Right specialises in affordable, high-quality aluminium bi-fold doors using the impressive profiling system from Smart Visofold 1000. With a thermally-broken design, offering both strength and thermal-efficiency. These bi-fold doors are a worthwhile addition to your home in the Kent, Maidstone and surrounding areas.